Spring has arrived! Depending on where you live, however, it may not officially feel like spring yet. Eventually, we’ll experience warmer weather and have the opportunity to spend more time outside. For people dealing with varying degrees of joint pain, the change in scenery through outdoor walks and exercise may help, but it’s important to be aware of certain hazards. Pollen, for one. 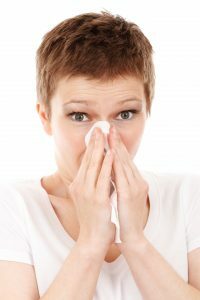 If you suffer from allergies and tend to sneeze and sniffle more when trees and plants bloom, you should know how to head off serious illness. You may not be aware, though, that spring allergens could affect your aches and pains. When exposure to tree pollen and allergens from grass and pet dander causes you to cough and sneeze and your eyes to water, your body will work naturally to fight off such invasions. As a result of these negative reactions, inflammation in your joints increases and you may end up dealing with stiffness in your fingers, knees, and arms. The sooner you prepare for spring, the better the chances of enjoying life outdoors. Be mindful of pollen counts in your area before you go outside. Look for a local news site or phone app that offers updated information, to help you determine the best window for outdoor exercise. If you have concerns about your health, consult with your doctor about allergy medication. It’s also important to avoid tracking the yellow stuff into your house. Make sure everybody in the family wipes their feet, and that your windows and doors are properly sealed to prevent leaks. Keep your laundry in a designated place so any allergens brought in that way are confined. At Bon Secours, our physicians and staff provide quality treatment for joint pain through every change in seasons and throughout the year. If you find your joint pain worsens as the weather warms up, it’s possible there is a connection. Contact us today for more information about joint pain and arthritis relief, and to find the right solution for you.